I have always regarded Clos Du Val as one of the few Napa Valley wineries not to sell out and conform to the ultra-rich, creamy, chocolaty, and perhaps over-stylized wines that are filling so many cellars these days. I for one sometimes really enjoy those type of wines, but I really respect vintners that go about there business maintaining their steadfast traditions. If there exists a California wine producer that strives to make wines reminiscent of classic Bordeaux claret, then this is it. I have also been quite impressed with the longevity of these wines even in their basic or "Classic" tier. This vintage of the Napa Valley Cabernet Sauvignon is composed of 86% Cabernet Sauvignon, 9% Cabernet Franc, 3% Merlot, and 2% Petit Verdot. It was aged for a total of 18 months in French oak barrels (25% new). On the nose I get aromas of dark chocolate, black raspberry, savory spices, graphite, tar, hints of prune, leather, and scorched earth. The bouquet evolves brilliantly with time in the glass, which suggests that as this wine ages the aroma profile will continue to improve and develop. 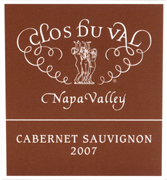 Clos Du Val is one of my all-time favorite wines! Just love it. I'll be attending Barrel Tasting weekend in Sonoma County in a few weeks, wish Napa Valley did something like that!